Enactus Canada, the country’s largest student leadership development organization, has named Laurier student Cole Jones Ontario’s 2015 Student Entrepreneur Provincial Champion. 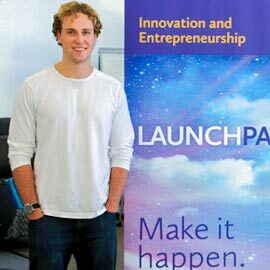 Jones, a fourth-year philosophy student at Laurier, is also the owner of Laurier LaunchPad startup Local Line – a platform that connects chefs with local food in their communities. Enactus Canada, along with the program supporter John Dobson Foundation, named provincial champions coast to coast as part of the Student Entrepreneur National Competition. Local Line is an online platform that connects chefs with a “menu’s worth” of local food – and therefore local farmers – in their communities. The platform removes barriers for chefs such as multiple, time consuming and frustrating orders and invoices while connecting local farmers with businesses to consistently sell their products. Jones will showcase his business and personal accomplishments as an entrepreneur at the Enactus Canada Regional Exposition–Central Canada in Mississauga on March 9, where he will compete for the title of Regional Champion. Jones will compete against three other provincial champions from central Canada for the regional title and the chance to move on to the 2015 Enactus Canada National Exposition in Toronto, May 11-13. The National Champion will receive a $10,000 cash prize and take home the John Dobson Cup. Jones has also been nominated for Small Business of the Year and the Environment and Sustainability Award as part of the KW Chamber of Commerce Business Excellence Awards for 2015, which will be announced in late February.